A Staten Island mansion that was the site of a mafia slaying and is now considered haunted will play host to an interactive theater piece tracing the home's bloody history. The Kreischer Mansion at 4500 Amboy Rd. will open its doors to the public on Saturday for a "Halloween Thriller" with tours of the home, dancing, art pieces, a seance and an "immersive" theater project about the building's history, said Ezat Luba, 33, whose father owns the property. "The point of this event is to bring a new audience and to bring exposure to this house to people out of Staten Island, and for people on Staten Island," Luba said. Each floor of the house will be dedicated to one of the activities, with seances in the attic and a haunted house in the basement. "It’s going to be more of a texture sensory thing," said Luba, a veterinarian. "It’s going to be in the dark." On the second level, a dance company Luba knows will take groups through an immersive theater project with each room delving into the history — and supposed haunting — of the home. "You go through the room and you get to experience each of the storylines," she said. "All the rooms connect, you can can go around the rooms pretty seamlessly." The home was one of two identical mansions built in the 1880s by brickmaker Balthasar Kreischer for his two sons — Charles and Edward — that overlooked the family's factory, the Associated Press reported. A year after the homes were completed, Kreisher died. His factory burned down a few years after that, according to Luba and the AP. The factory was later rebuilt but had troubles that reportedly caused Edward Kreischer to shoot himself In 1894, the AP reported. Even though his home burned down in the 1930s, Edward Kreischer's weeping wife has been reported to be heard in the remaining mansion, the AP reported. People also reported other ghosts haunting the house including a cook who killed himself inside and a man and a woman who appear and slam doors. Scratching noises were also reported to be heard in a closet where the kids were kept when they were in trouble, according to the wire service. The property changed hands several times until Luba's father, Isaac Yomtovian, bought it in 1998. In 2005, then-caretaker Joseph Young was charged with killing Robert McKelvey in the home, the AP reported. Young was reportedly paid $8,000 by the Bonanno crime family to kill McKelvey and in April 2005 lured him to the property where he stabbed and strangled him before sawing his body to pieces and burning them in the furnace, according to the AP. 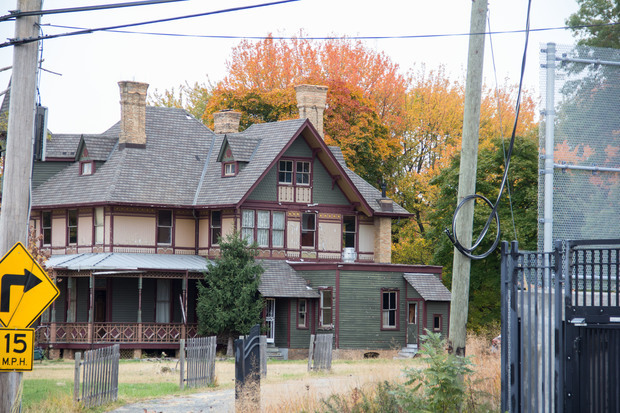 The home has largely remained unused since, but has been rented out as settings for shows including "Boardwalk Empire" and "Bones" and for photo shoots, Luba said. "My dad still just wants to sell it," said Luba. "I'm just taking advantage of it while I can." The "Halloween Thriller" is on Saturday from 8 p.m. to 3 a.m. Advance tickets are $40 for early admission and $60 with a seance. The event is for ages 21 and older. For more information visit the website.